This stew is a terrific way to change the way okra is served. 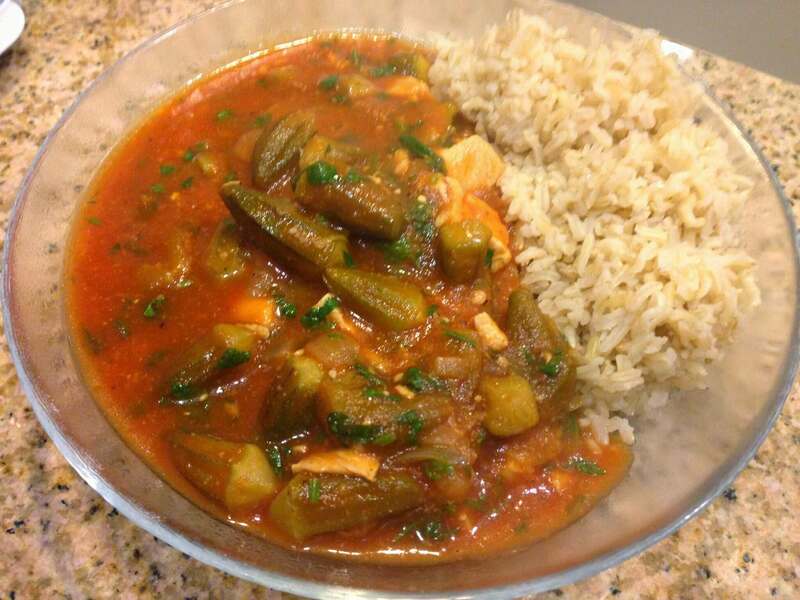 This savory stew marries the distinct flavor of okra with a zesty tomato sauce and tender chunks of chicken. But many people don't like chicken in their stew, so if you like the alternative vegetarian version, just leave the chicken out and use vegetable broth to replace the 2 cups of water in the recipe. And if you like lamb or beef stew meat, you can use that instead, just cook the meat with water, a bay leaf, 1 tsp salt, and half an onion cut up, in a pressure cooker for 30 minutes. And instead of water for the recipe, use 2 cups of the meat broth. In a 3-quart pot over medium heat, heat 2 tablespoons extra-virgin olive oil. Add chicken, and cook for 5 minutes. Remove chicken to a plate, and set aside. Add remaining 2 tablespoons extra-virgin olive oil to the pot. Add okra and yellow onion, and cook for 7 minutes. Return chicken to the pot, and add tomato sauce, water, salt, black pepper, and cayenne. Cook for 20 minutes.